Click to download the full briefing. Oil Change International and Friends of the Earth U.S. 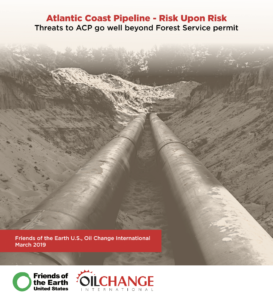 The Atlantic Coast Pipeline (ACP), a proposed fracked gas pipeline owned by Dominion Energy, Duke Energy, and Southern Company, faces some of the stiffest community and environmental opposition in the country today, comparable to that faced by TransCanada’s ill-fated Keystone XL project. Seventeen months after the project was granted certification by the Federal Energy Regulatory Commission, construction has barely progressed due to this opposition and other sources of risk. The ACP, if completed, would be a 600-mile, 42-inch-diameter pipeline carrying fracked gas from the Appalachian Basin in West Virginia through Virginia to North Carolina. First announced in 2014, the project is two years behind schedule and substantially over-budget. The latest update from Duke Energy estimates the project cost at between $7 to $7.8 billion – 37% to 53% higher than the original estimate of$5.1 billion – with the latest date for full operation now pushed back to 2021. The Pipeline Compliance Surveillance Initiative, an unprecedented citizen initiative positioned to ensure strict compliance with environmental laws and regulations, even in remote locations, if construction proceeds. It would be prudent for investors in Dominion, Duke, and Southern to question whether pursuing the ACP further is a good use of capital. As the transition to clean energy gathers pace, the risks and growing costs of this major methane gas pipeline project look increasingly unwise to ratepayers, regulators and investors alike. 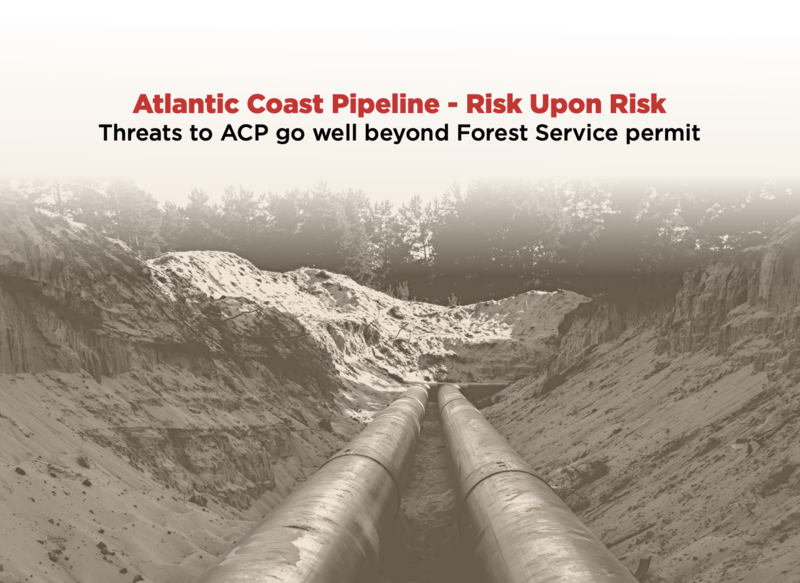 The Atlantic Coast Pipeline (ACP) poses even bigger threats to investors than the current multibillion dollar budget overruns. It is very possible that the route of the ACP may need to be changed due to court rulings that the pipeline cannot cross the Appalachian Trail in its current proposed location, or cross any part of our national forests. A route change to meet these legal requirements would cover countless miles, would be very expensive, and extremely time consuming. The route may need to be changed as well due to endangered species. The current proposed route passes through areas that contain a number of endangered species. One of these species is the very highly endangered Rusty Patched Bumble Bee, which has been recently found for the first time east of Ohio in recent years in Bath and Highland Counties Virginia. The Xerces Society states that Bath and Highland Counties are the most important area in our country for survival of the Rusty Patched Bumble Bee. Over 33 miles of the current ACP route would pass through Bath and Highland Counties. In fact, the pipeline, and an additional 5 mile long industrial access road for the ACP are proposed to pass through the High Potential Zone, or the area where the Rusty Patched Bumble Bee has been found, and is most likely in it’s highest concentration. The access road would destroy large numbers of Mountain Laurel and Rhododendron bushes, which are a preferred food source for the Rusty Patched Bumble Bee, and on which they have been found feeding. The courts threw out the United States Fish and Wildlife Service’s (USFWS) original biological opinion and incidental take statement in a very strongly worded decision, and then quickly issued a stay, or hold, on the second USFWS opinion and statement. A hearing on that case will not be heard at lest until May, with a decision probably several months later. The decision could very well be negative. The ACP cannot proceed without a valid and legal opinion and statement from the USFWS. The Endangered Species Act requires consideration of alternate locations for projects that threaten endangered species. So there is a distinct possibility that the ACP will have to be re-routed, and that would be very expensive and time consuming. A new route would have to be determined. It is quite possible that another environmental impact statement would have to be written for that route. This would entail extensive periods of public comment. If the new route was found to meet environmental requirements, eminent domain for a large number of private properties would have to be adjudicated by the courts, and a number of other permits would have to be applied for, and obtained as well. Other potential cost prohibitive issues for the ACP involve the pipes. The ACP has left the estimated 80,000 pipes needed for the pipeline stockpiled in the sun for over three years. The fusion bonded epoxy (FBE) coating for these pipes degrades and chalks off the pipes from sunlight. The Federal Pipeline and Hazardous Material Safety Administration (PHMSA) confirms this loss of protective coating. Most experts advise that the pipes are probably safe after 2 years of storage in the sun, but may not be safe beyond that. The pipes are already well beyond that, and will remain in storage indefinitely, since the project is now stopped. Loss of corrosion protective makes the pipes vulnerable to failure, and catastrophic explosions. It is possible that many of these pipes will need to be recoated or replaced. Many of the pipes for the famous Keystone XL pipeline had to be replaced or recoated due to excessive storage. The estimated cost of the pipes for the ACP is $400 million, and re-coating or replacing them would be very expensive. Additionally, the 3M Scothkote Fusion Bonded Epoxy 6233 coating contains carcinogenic, mutagenic, and toxic materials per the Material Safety Data Sheet (MSDS). The MSDS also lists a number of negative health impacts, including respiratory issues, skin irritation, eye irritation, and gastrointestinal irritation. Materials in this coating are also linked to birth defects and reproductive harm. Since this coating is chalking off the pipes it is escaping into our environment and likely entering the bodies of persons through inhalation and ingestion in drinking water. Those on or near the proposed pipeline are especially at risk. These pipes may also need to be re-coated or replaced due to the possible negative health impacts from the chalking coating. Water and air sampling, as well as cleanup may also be required, at substantial additional cost. Notwithstanding Dominion’s rosy presentation to investors in New York yesterday, the ACP is in financial trouble. Wall street knows it, and we know it.